The new millennium kicked off with a marathon satellite telecast spanning all corners of the globe. Meanwhile with the new millennium came TV’s new programming trend – reality programs and game shows, and a new technology as Australian TV enters the digital age. By the end of the decade all free-to-air networks have launched digital multi-channels – while an old friend, Hey Hey It’s Saturday, makes a return appearance and two long-running programs, Rove and All Saints, sign off. Popstars, Seven’s behind-the-scenes look at the formation of a pop group, earns massive ratings and leads to huge sales for its end product Bardot. Nine’s Sale Of The Century becomes Sale Of The New Century and celebrates twenty years on air. Seven is the host Australian broadcaster for the the Games Of The XXVII Olympiad from Sydney — setting new ratings records with the opening and closing ceremonies and continuous Olympic Games coverage. Ten’s new shows Above The Law and The House Of Hits fail to attract decent ratings. October 9: Rove Live, the weekly talk show hosted by Rove McManus that was axed by Nine in 1999, makes its debut on Ten. TV stations conduct test transmissions in digital. Metropolitan TV stations commence full-scale digital transmission on 1 January and simulcast with existing analogue transmissions. ABC and SBS permitted to operate “multi-channel” services via the digital platform. Digital services to be gradually introduced over the following years. The measurement and reporting of TV ratings data for the five major capital cities (Sydney, Melbourne, Brisbane, Adelaide, Perth) is taken over by OzTAM, a joint venture between the Seven, Nine and Ten networks. February: Seven premieres the Australian version of the hit UK game show The Weakest Link and the second series of the popular Popstars. March 5: Renaissance TV, a unique TV concept of programs aimed at the over-55 age group, makes its debut in the previously unused daytime timeslot of Melbourne’s Channel 31. April 24: The Australian version of the international reality TV franchise Big Brother premieres on Ten. May: ABC announces the upcoming launch of its two new digital channels, ABC Kids and FLY. September 11: Terrorist attacks in the United States spark continuous coverage, for up to 48 hours, on all five free-to-air networks — predominantly relaying news feeds from US networks CNN, NBC and ABC as well as from BBC in London. December: Sale Of The Century is “rested” after 21 years, with plans to revive it with a new format in the future, and Neighbours produces its 4000th episode. The Australian Broadcasting Authority launches an investigation into the adequacy of local news and programming in regional areas, sparked by the axing of regional news services by Prime Television and Southern Cross Broadcasting’s Seven and Ten network affiliates. The Nine and Ten networks and Foxtel commence their five-year deal to televise the AFL — having lured the rights away from Seven. Seven televises the 2002 Commonwealth Games and 2002 Winter Olympic Games and takes over the rights to the Melbourne Cup Racing Carnival from Network Ten. SBS launches its first digital channel, the SBS World News Channel, with continuous news broadcasts from around the world in languages other than English. A raft of new local dramas with the premiere of Young Lions (Nine), White Collar Blue (Ten), Marshall Law (Seven) and MDA (ABC). ABC, Seven and Nine networks present live coverage of the first anniversary of the September 11 terrorist attacks. Kath And Kim, the eight-part ‘reality sitcom’ based on characters from former comedy shows Big Girl’s Blouse (1994) and Something Stupid (1998), is a surprise hit for ABC. New shows include The Big Bite (Seven), Comedy Inc (Nine), Skithouse (Ten), Micallef Tonight (Nine), Enough Rope With Andrew Denton (ABC) and The Chat Room (Seven). Seven’s breakfast program Sunrise begins to challenge the dominance of Nine’s Today. ABC announces closure of digital TV channels ABC Kids and Fly TV, effective 30 June. The Australian Broadcasting Authority (ABA) invites applications for licensees to operate community TV channels in Sydney, Melbourne, Brisbane and Perth — following successful ongoing trials which commenced in 1994. Allocation of the Adelaide licence is postponed after trial broadcaster ACE ceases operation and a new trial commences with new channel C31. Seven’s telecast of the Rugby World Cup final is the most watched program for 2003, followed by the series finals of Australian Idol (Ten) and The Block (Nine). The final episode of the second series of Kath And Kim attracts the highest ratings for any comedy program on ABC since Peoplemeters were introduced in 1991. December 31: Southern Cross Ten begins transmission in the Port Pirie and Broken Hill regions as a secondary licence to existing broadcaster Central Television (GTS4/BKN7). January 1: Tasmania’s third commercial station Tasmanian Digital Television (TDT) begins transmission in Hobart as Australia’s first digital-only commercial TV station, featuring programming predominantly from Network Ten. TDT is operating as a joint venture between existing local networks Southern Cross and WIN. TDT expands coverage to Northern Tasmania in mid-2004. April: David Stratton and Margaret Pomeranz announce their resignation from The Movie Show on SBS after 17 years, moving to ABC to present new program At The Movies. The ABA allocates community TV licenses to TVS (Television Sydney), C31 (Melbourne), Briz 31 (Brisbane) and Access 31 (Perth). Applications are called to operate the ongoing community TV licence in Adelaide following renewed trials by C31. July 26:Big Brother increases its prize money to $1 million — won by Fijian-born Trevor Butler. August: Seven televises the 2004 Olympic Games from Athens, Greece, in partnership with SBS. October: Daryl Somers returns to TV after a five year absence to host Seven’s surprise hit Dancing With The Stars, an adaptation of a similar British program. January 8: The Seven, Nine and Ten networks combine to televise Australia Unites: Reach Out To Asia, a 3-hour concert/telethon to raise funds for the relief effort of victims of the Asia Tsunami. The appeal raised more than $A20 million. January 31: Music quiz show RockWiz with Julia Zemiro debuts on SBS, one week before ABC launches its own music-themed quiz show Spicks And Specks with Adam Hills. March 7: ABC launches its new digital-only television channel ABC2 — containing a mix of original programs, such as regional news and information, and ‘time shifted’ content from the main ABC channel. Neighbours celebrates its 20th anniversary with guest and cameo appearances from former cast members. May 12: Kath And Kim screens for the first time on BBC2 and is later nominated for Best International Comedy TV Show at the British Comedy Awards. May 30: The Sale Of The Century format is revived on Nine with the new title Temptation, hosted by Ed Phillips and Livinia Nixon. SBS televises the Ashes Test series cricket from England, and the qualifiers for the 2006 FIFA World Cup (in which Australia was successful in gaining a place) achieving the network’s highest ever ratings. Australian TV enters its fiftieth year and Foxtel and Austar celebrate their 10th birthdays. November 21: Community TV station Television Sydney begins program transmission on UHF Channel 31, leading up to its official launch in early 2006. December 16: The final edition of Good Morning Australia, and Bert Newton leaves Network Ten after 14 years. December 26: Kerry Packer, owner of Publishing And Broadcasting Limited (owners of Nine Network and Australian Consolidated Press), dies in Sydney at the age of 68. Control of his media and business empire is handed down to son James. January 1: Mildura Digital Television, a joint venture between local broadcasters Prime and WIN, commences transmission as Ten Mildura — providing the region with a dedicated Network Ten signal for the first time, broadcasting in digital. January 5: The Australian Football League (AFL) announces that it has accepted the bid by the Seven and Ten networks to televise AFL matches for the 2007 to 2011 seasons. The Seven/Ten bid of $A780 million is the largest ever offered for a sporting telecast deal in Australia. January 30: The Nine Network and regional affiliates WIN and NBN launch new logos. February 9: Eddie McGuire, presenter of Nine’s Who Wants To Be A Millionaire and The Footy Show (AFL), is announced as the new CEO of the Nine Network, taking over from caretaker CEO Sam Chisholm. March: The Nine Network is the host Australian broadcaster for the XVIII Commonwealth Games from Melbourne. Pay TV operator Foxtel also provides extensive Games coverage offering seven dedicated channels on its digital platform. April 5: The premiere of Network Ten’s Thank God You’re Here which becomes one of the big hits of the year. June-July: SBS achieves record ratings figures with live coverage of the FIFA World Cup from Germany, with most games televised between midnight and early morning. SBS also secures television coverage rights to the 2010 and 2014 FIFA World Cup competitions. September: Australian TV turns 50, with special event programs on the Seven and Nine networks. January 5: TV news website TV Tonight is launched. April: Changes to media ownership laws spark a number of sales and purchases: James Packer sells control of his media empire (PBL Media) to private equity firm CVC Asia Pacific. STW9 Perth and NWS9 Adelaide are bought by regional broadcaster WIN, and NBN in Northern NSW is bought by PBL Media, owner of TCN9 Sydney, GTV9 Melbourne, QTQ9 Brisbane and NTD8 Darwin. May 18: Eddie McGuire announces his resignation from the position of CEO of the Nine Network. July 3: Macquarie Media Group (MMG) announce plans to buyout Southern Cross Broadcasting, owner of regional Southern Cross Television and Southern Cross Ten networks and the remote area Seven Central service. July 13: National Indigenous Television (NITV) begins transmission via Optus satellite to remote and central Australia. October 13: The Nine Network and pay-TV operator Foxtel have announced their purchase of exclusive Australian broadcast rights to the 2010 Winter Olympics from Vancouver and the 2012 Summer Olympics from London — the deal believed to be worth around $110 million. October 15: Seven launches its high-definition channel 7HD — Australia’s first commercial digital multi-channel, broadcasting in high-definition. January 14: Nine Network changes its logo again, reinstating the former “dot” logo. January 16: Network Ten and Foxtel announce a partnership to televise the 2010 Commonwealth Games from Delhi, India. February 8: ABC launches the re-branding of its main channel as ABC1, to supplement its digital-only channel ABC2. February 13: Nine’s drama Underbelly, based on real-life events in Melbourne’s underworld scene, debuts across the country except in Victoria where screening is banned pending a court trial related to one of the series’ characters. March 17: Nine Network launches its high-definition channel 9HD. April 28: Darwin’s third commercial TV channel Darwin Digital Television commences transmission — providing the city with a dedicated Network Ten signal for the first time. August: Seven and SBS televise the Olympic Games from Beijing, China. August 26: Seven launches its new drama, Packed To The Rafters, which becomes an instant hit. November 3: ABC’s digital channel ABC2 launches ABC News Breakfast, providing an alternative early-morning news coverage to the long-running Today and Sunrise programs. February 8: Seven launches its new Sunday night current affairs program Sunday Night. June 1: The SBS World News Channel is replaced with SBS2 — featuring foreign-language news bulletins with a mix of time-shifted and exclusive programming and movies. 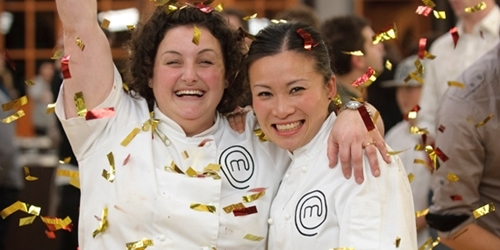 July 19: The finale of the inaugural series of Masterchef Australia draws the highest audience of any non-sports program since OzTAM records were introduced in 2001. July 20: The 7PM Project (later The Project, following a timeslot change) debuts on Ten. August 9: The Nine Network launches its new digital channel, GO! September 30: The cast of Hey Hey It’s Saturday are reunited for the first of two specials almost ten years after the show was cancelled. October 27: After 12 seasons and 493 episodes, Seven’s All Saints comes to a conclusion. November 1: The Seven Network launches its new digital channel, 7TWO. November 15: Rove McManus announces the end of his weekly show, Rove. December 4: Prime Minister Kevin Rudd launches ABC’s new children’s channel, ABC3. Hi, Foxtel’s official launch event for digital TV was on Sunday March 14 2004, not March 15.